Finally got some time to upload some pictures of projects that I’ve working on around the garage. 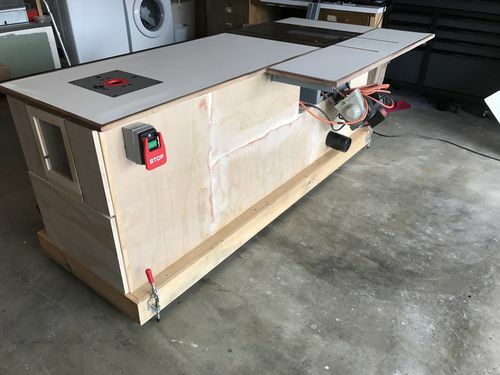 This is my table saw build that I thought matched my needs for my garage. Like other jocks, I need to be able to move my tools out of the way for my wife’s car and other typical garage stuff. 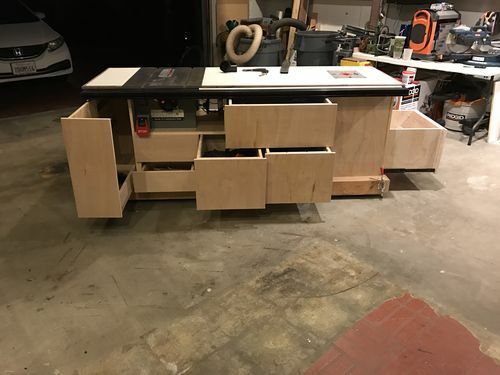 I wanted the combination of a table saw, and a router wing. 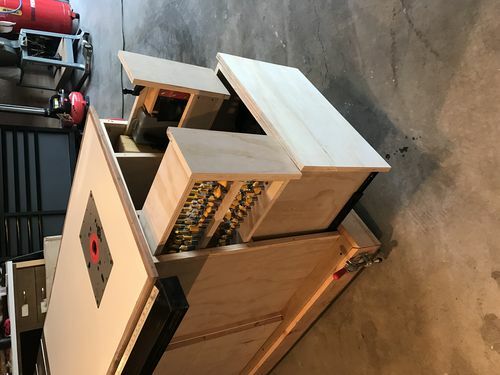 I also wanted to have plenty of storage on board the saw cart. I took a lot of notes from other Jocks and made a collaboration of them all into what you see here. Anyway, it took me quite a long time to complete, but now that it’s done I love it. I still would like to improve the dust collection some more. 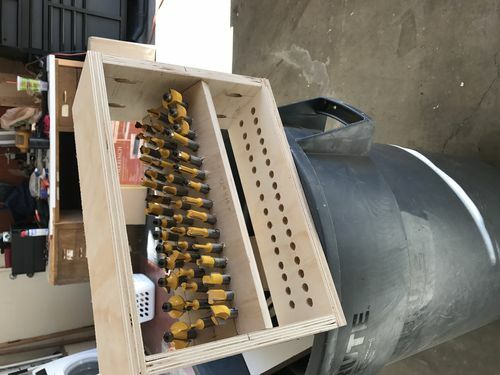 I’ve noticed some other Delta contractor saws with the enclosed back, and I think I’ll end up doing something along those lines. Thanks for checking it out, and all comments welcomed. WOW, that is one fine workstation!!!!!!!!!!!!!!!! That is really cool. I can tell you put a lot of thought into it. I am in the process of doing something similar. Do you have a link for the toggle clamps you used and how stable are they when extended? Thank you and it looks great! That looks super useful ! The router stop-switch is in the right spot that can’t be missed. I like the final finish – white/black looks good on it. Very well done. The storage is great!